Blue Dragon and Lost Odyssey developer Mistwalker are hard at work on something new, something unannounced, something that's apparently entering the "'finishing' stage" according to mustachioed founder Hironobu Sakaguchi. 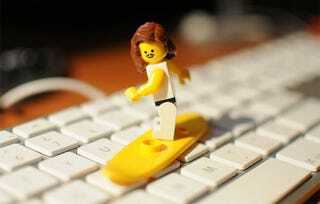 Unfortunately, that something is probably not a LEGO surfing RPG. Sakaguchi notes in his latest Mistwalker update that he is "working hard on a new project" and that it's almost done. Of course, he said it's "almost done" in June as well, but we're ready to believe him this time. "Now we are being rushed into the "finishing" stage," Gooch says, adding "No matter what, I will make it really good." Sakaguchi said the unnamed game for an unspecified platform "makes tactical use of 'confusion and order on the battlefield' in real time" previously. While we're entertaining best guesses about Mistwalker's latest, we're guessing it's not another Blue Dragon game (Blue Dragon: Ikai no Kyoju was just released), not Cry On and not based on this lovely concept art.